LANSING, Mich. – Lansing Ignite FC and Michigan State University Athletics have jointly announced today the formation of the Capital Cup. The Capital Cup will be an annual competition between the USL League One club and the Spartans, with the inaugural match set to kick off at 7 p.m. ET from Cooley Law School Stadium on April 16. The Capital Cup is included as a part of LIFC season tickets, while single-game tickets for the match will be made available starting in March. Set to kick off its first season as a professional club in League One, LIFC will be led by Head Coach Nate Miller and assistant coaches Joel DeLass, Tim Daniels and Wail Zenga. The team’s roster will be comprised of more than 20 players, featuring numerous talented athletes, such as Xavier Gomez, Rafa Mentzingen, Kevin Coiffic and Christian Silva. Michigan State’s men’s soccer team is led by Head Coach Damon Rensing and is coming off one of its best seasons in program history, finishing the year with a 14-5-4 overall record while reaching the 2018 College Cup. The Spartans have produced numerous talented players now playing professionally in the United States and around the world, including Fatai Alashe, Jay Chapman and Ken Krolicki. LIFC will begin its League One campaign against the Richmond Kickers in Richmond, Virginia, on March 30 and against Greenville Triumph SC in Greenville, South Carolina, on April 6. The club will then return home to prepare for its week-long, home-opening celebration. 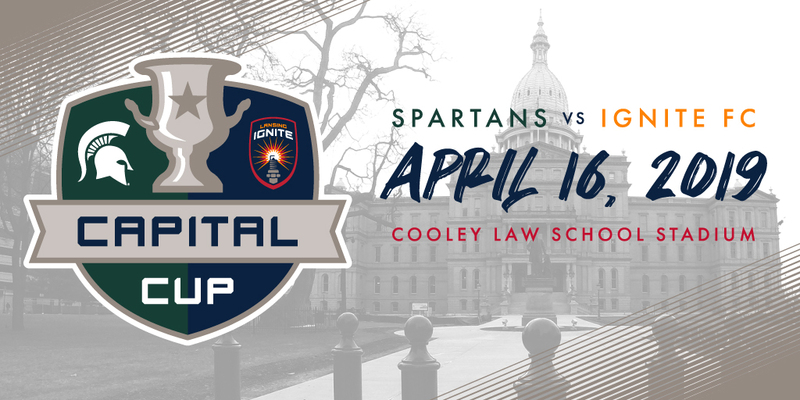 LIFC will hold a celebration in downtown Lansing ahead of the team’s first League One match at Cooley Law School Stadium against the Kickers on April 13, and the celebration of soccer in the Michigan capital will continue three days later with the Capital Cup. For more information on Ignite FC, visit www.lansingignite.com or follow the team on Twitter, Facebook and Instagram.